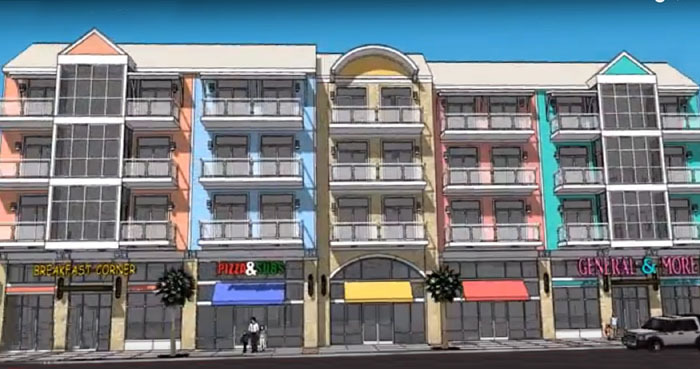 If the news pans out, we are soon going to have a smaller version of Market Common in downtown Myrtle Beach. After a putt-putt golf course between the Diplomat Hotel and the Art Burger went out of business, it left a good block of prime oceanfront property empty at 7th Ave North and Ocean Blvd, except for a few palm trees and sand. The Market Common retail district has proven to be very successful, and while this is much smaller, they plan to build it in the same style. Retail stores or offices will be ground level, where vacationers will walk by and hopefully shop, while the upstairs will be condos. It works well for small store owners as well as investors. Whether they would allow condos to be used as vacation rentals or limit them to owners/annual rentals has not been announced, but at this time it is being discussed as residential condominiums. Plans are to realign the part of Highway 501 as it enters Kings Highway, to have traffic going to Ocean Blvd naturally by way of 7th Ave North. City planners call it a new "gateway" to the beach, thus the name of the project as Gateway Galleria. If final plans are approved, construction could start as early as the fall of 2018. Would you like to buy an oceanfront condo at Gateway Galleria? Get on our mailing list and tell us of your interest. We'll keep you up to date with further news on the project. Rendering of a similar project by Miller Designs, Inc.